New research says AEBS would prevent crashes by around 25 per cent. 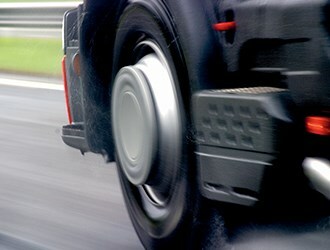 Research calls for heavy vehicles to include AEBS. A quarter of fatal heavy vehicle crashes would be avoided if autonomous emergency braking systems (AEBS) were fitted, new research says. A report from the Monash University Accident Research Centre, on behalf of the Vehicle Safety Research Group, analysed the benefits of fitting AEBS, electronic stability control (ESC), warning systems and lane departure warning systems in heavy vehicles and found AEBS the most critical. Heavy vehicle operators have been encouraged by the NRMA Motoring and Services, Centre for Road Safety and RACQ to take note of the benefits of crash avoidance technologies in the wake of the news. "Of the four technologies assessed, this research found that autonomous emergency braking systems would make the biggest difference, reducing fatal heavy vehicle crashes by around 25 per cent if fitted to all heavy vehicles," NRMA vehicle safety expert Jack Haley says. "Lane departure warning systems, electronic stability control and fatigue warning systems could also deliver safety benefits, with each of these technologies estimated to prevent around four to six per cent of Australian fatal heavy vehicle crashes, if fitted to all heavy vehicles." Centre for Road Safety general manager Marg Prendergast has also come out strongly to support the research. "While a lot of research has investigated the benefits of fitting these kinds of technologies to light vehicles, this is really the first time we’ve had some insight into the real world benefits that could be delivered if they were fitted to all heavy vehicles," Prendergast says. "We know that heavy trucks are over-represented in serious road trauma in NSW. In 2014, they made up around two per cent of all registered motor vehicles, accounted for around seven per cent of all motor vehicle travel, but were involved in around 17 per cent of all road fatalities." The statistics are similar in Queensland according to RACQ executive manager technical and safety policy Steve Spalding, who reports 18 per cent of road fatalities in the state last year involved heavy freight vehicles. "Heavy vehicle fatalities are over-represented and we need to do all we can to reduce the number of serious crashes," Spalding says. "We are only going to be seeing more heavy vehicles on our roads in the future which risks even more serious or fatal crashes," he explains. "Truck drivers are working under intense deadlines and are often driving long distances on roads that aren’t always in the best condition. By choosing vehicles with the latest safety technology, the industry can help make their jobs safer." In a Fatal Heavy Vehicle Crashes report released in April, the Department of Infrastructure and Regional Development confirmed 200 people were killed in 174 fatal crashes involving heavy trucks around Australia last year. While the report says fatal crashes including articulated trucks decreased by an average of 9.3 per cent over the previous three years, 2014 saw a 12.4 per cent increase on 2013. Heavy rigid trucks crashes also rose in 2014, an increase of 18.8 per cent when compared to 2013, but have also risen over the three years previous by an average of 4.2 per cent per year.